A haphazard record of experience, feeling and thought . . . 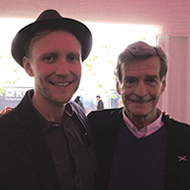 This year’s Bloody Scotland International Crime Writing festival is the first since the passing of the great William McIlvanney, the man who, more than anyone, established the tradition of Scottish detective fiction. 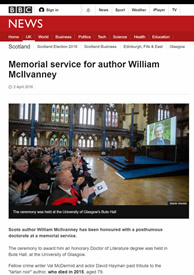 Bloody Scotland 2016 is dedicated in his honour and the winner of the Scottish Crime Book of the Year will now be awarded The McIlvanney Prize at an awards ceremony on the opening evening, Friday 9 September, in Stirling. 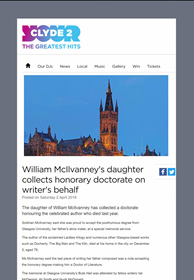 The award recognises excellence in Scottish crime writing, includes a prize of £1000 and nationwide promotion in Waterstones. 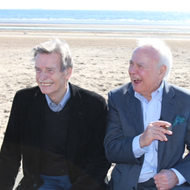 Willie's brother, sports journalist Hugh McIlvanney, will be in conversation with Graham Spiers at a number of Scottish venues during September and October 2016. The dates posted so far on Graham's Twitter are as follows: Oran Mor, Glasgow on Sept 29th; The Albert Halls Stirling on 30th Sept; The Brunton, Musselburgh on 1st Oct; University of the West of Scotland, Paisley on 4th Oct; City of Glasgow College on 6th Oct; and Palace Theatre, Kilmarnock on 12th Oct. 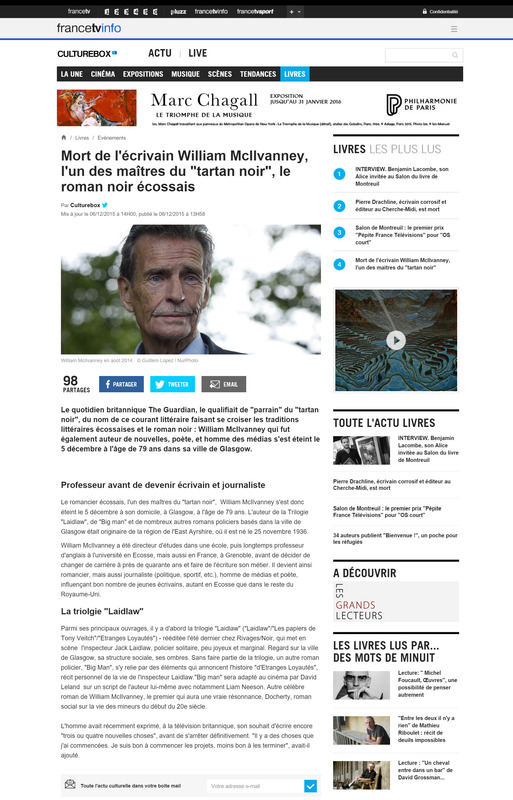 This website features writing by award-winning author and journalist William McIlvanney. 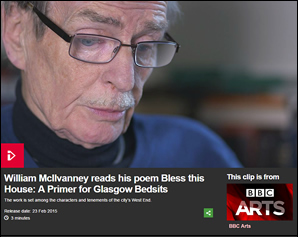 When Willie, Euan and I created it back in 2013, one or two new Dispatches were posted regularly and were archived on this site. 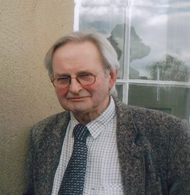 A lot of the writing featured was new and unpublished, although extracts from Willie's existing body of work - journalism, essays and short stories - were also included. Willie, whose technological limitations were legendary, was excited about the project. 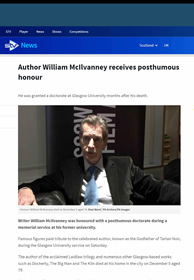 The Personal Dispatches name was chosen by Willie who was keen to see his "fragmentary record" of his personal experience published in print. 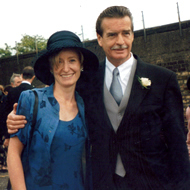 "On the 5th of December 2015 my uncle, William McIlvanney, passed away peacefully at home in the presence of those he held dearest – family and friends. Click here for all of the Dispatches posted. 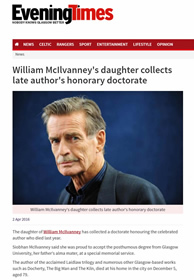 To read Doug Johnstone on William McIlvanney click here. 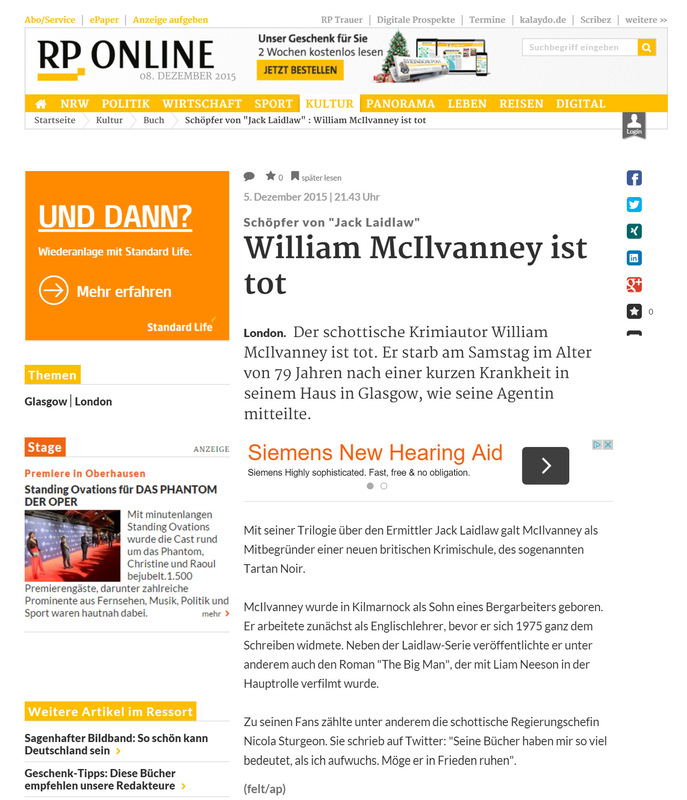 Willie and his website are featured on page 3 of S on S. Click here. 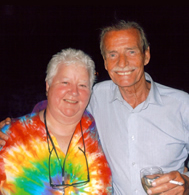 Willie and I first met with Jenny Brown, his devoted and tireless agent of recent years. It was in a tent one memorable Edinburgh book festival in 2012. I was immediately in awe and a bit in love with the man. We had no idea how lucky we were about to be. 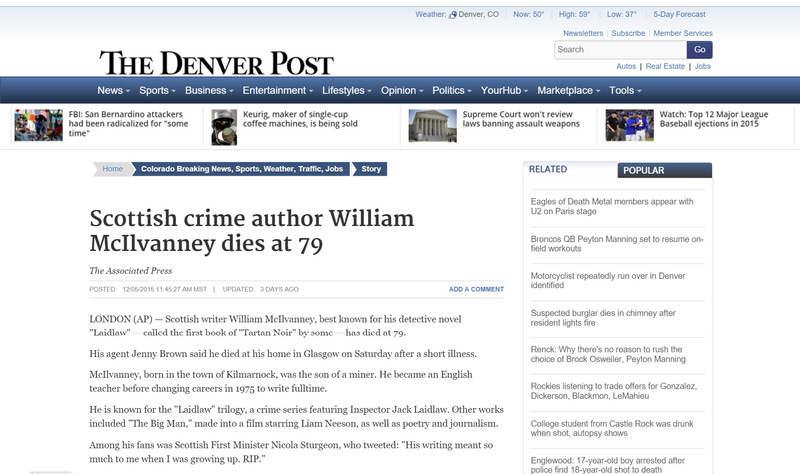 In memory of Willie McIlvanney, I will thus be brief. 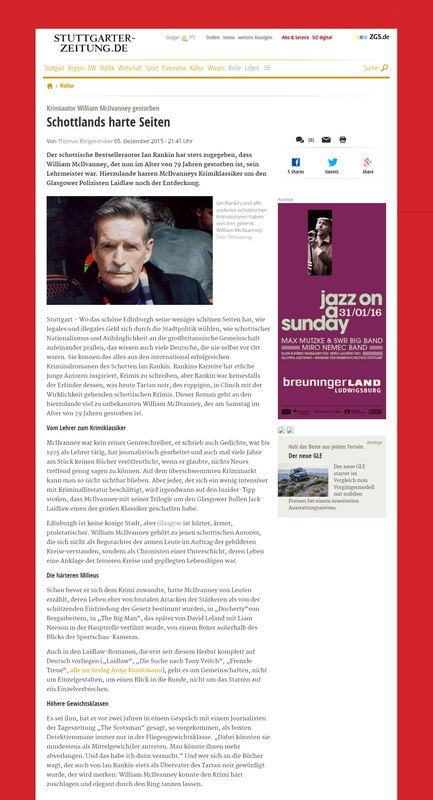 I will also, almost in tribute, stray somewhat from my brief of talking about Willie’s journalism. 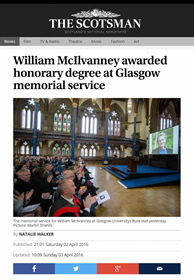 It’s an honour to have been asked by the family - Siobhan, Liam and Siobhan – to speak about Willie today, and to pay tribute to his life and work. I hope you’ll forgive me if restraint isn’t particularly conspicuous when I talk about my brother. 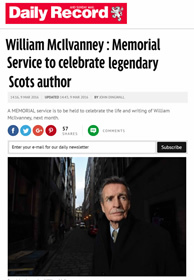 I think it’s a realistic hope because so many of you feel, as I do, that Willie was more than a wee bit exceptional. 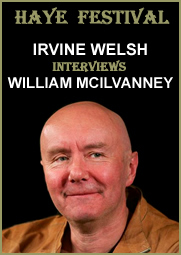 At the Haye Festival on Sunday June 2nd 2013, Irvine Welsh interviewed William McIlvanney. Check it out here. 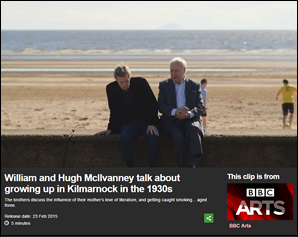 After one particularly dark question about the socio-economic conditions in eighties Scotland, Irvine lifted the mood with: "Anybody got a question about puppies, bunnies & kittens?" Love it! And what an infectious laugh! 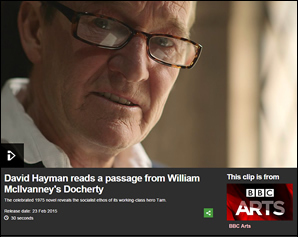 Check out William McIlvanney in conversation with Doug Johnstone at Canongate TV. 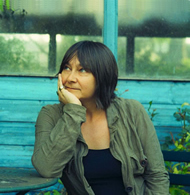 When they were first published, they won Silver Dagger awards and were nominated for Edgars. 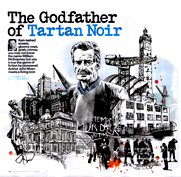 With Canongate Publishing due to re-launch the Laidlaw novels, starting in May 2013, We feature extracts from the novels, selected and introduced by Willie, as well as a few interesting extras. 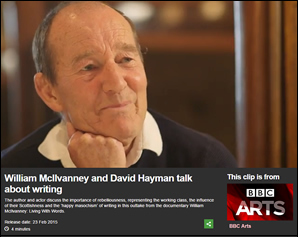 "Any attempt to understand such a life can’t seek to be definitive. 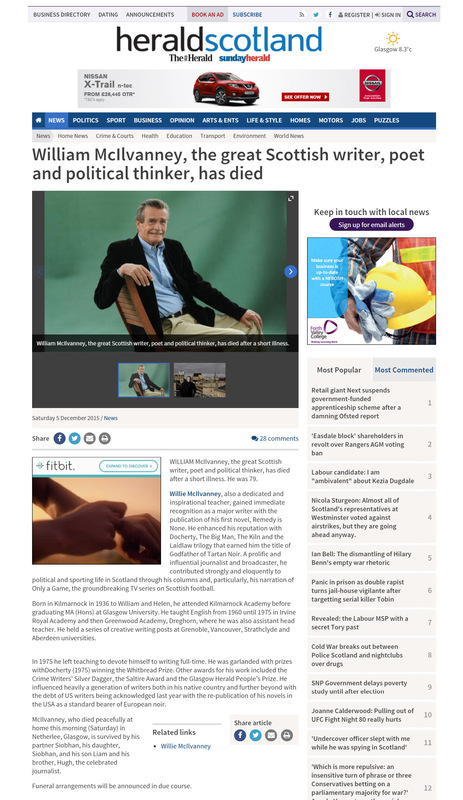 What it can possibly do is like archaeology , sink some speculative shafts into those times and, from what it finds, elicit some impression of the nature of the person, arrive perhaps at the salient features of the life...". "I'm on a late-night train leaving Central Station. I have the compartment to myself until the train begins to pull out. I can hear the scuffling sounds in the corridor outside that announce the man with drink taken who has just made it. Experience tells me he will soon be my travelling companion. He soon is....". 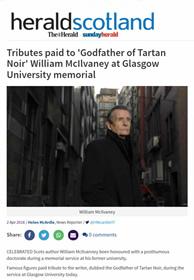 "At one stage, being even shorter of money than usual, I agreed to do a TV column for the Glasgow Herald. 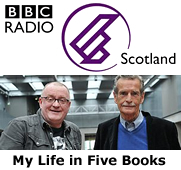 I enjoyed it but, finding I did virtually no other writing during that time, I soon gave it up. 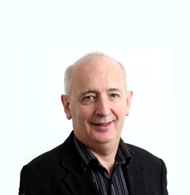 A few samples may give a flavour of that phase, round about 1979 - 1980, I think." While putting this site together for Willie, I decided to add some quotes of what people have said about him and his work over the years. Being a modest elder statesman, Willie was less than enthusiastic about the idea. However, despite Willie's objections, I have gone ahead and included the quotes anyway. They make interesting reading. 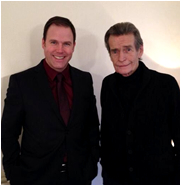 Known as the ‘Godfather of Tartan Noir’, William McIlvanney has enjoyed a career resurgence in recent years. 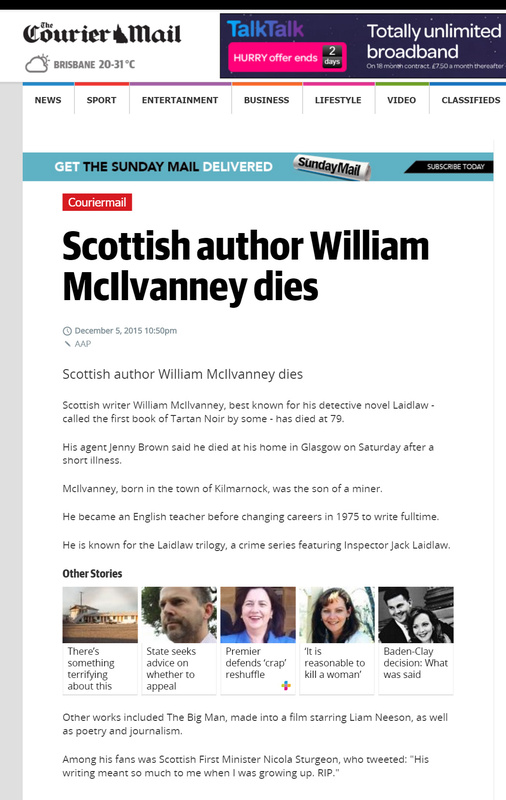 Landmark novels like Laidlaw have returned to print and earned him a new generation of admirers whilst Docherty was recently voted one of the top ten Scottish novels of all time. 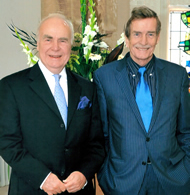 Living with Words, produced by Gill Parry, offers an intimate portrait of McIlvanney in his own words and those of family and colleagues, including his brother, celebrated sports writer Hugh McIlvanney . 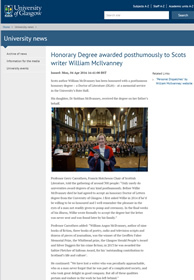 A welcome profile of a writer whose passionate sense of Scotland and socialist ideals have made him inspirational.